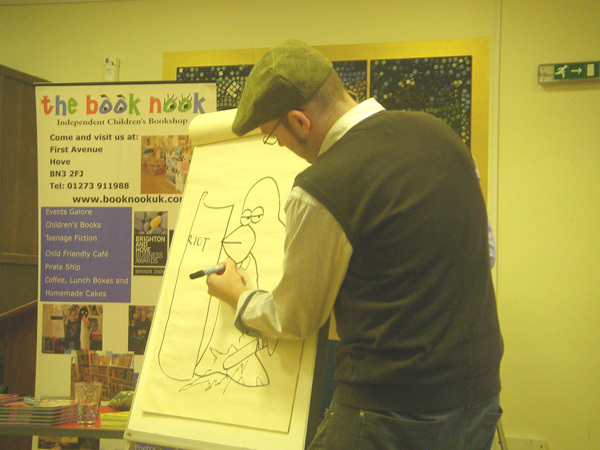 I've been out and about doing a bunch of talks and workshops lately - Tuesday last week I was in Leicester doing some workshops at Rushey Meade library, and then on Thursday and Friday I was down in Hove doing a couple of Mo-Bot High-related school events in association with The Book Nook, a wonderful children's bookshop and home to the greatest Victoria sponge cake it has ever been my privilege to eat. Seriously, the whole trip goes down as a Big Win for me, if only because of the cake. A penguin with a riot shield and lightsaber. What of it? I've done a few of these events now, and I think I'm starting to get the hang of it. 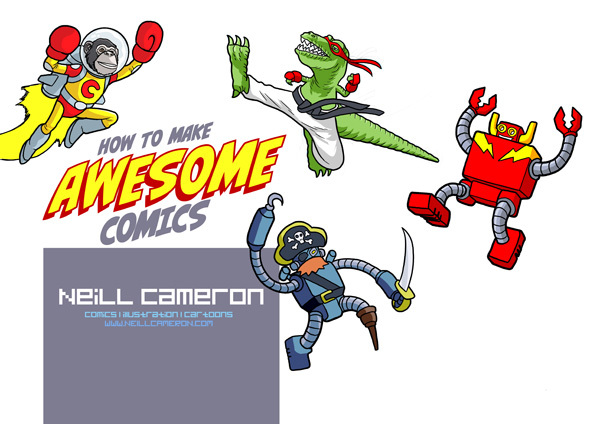 I'll generally talk for a bit about drawing comics and show a bunch of art, then get into giving some tips and ideas on how to create your own comics. I use a complex and nuanced system for coming up with ideas but I've simplified the basic gist into this handy diagrammatic form. Fig. 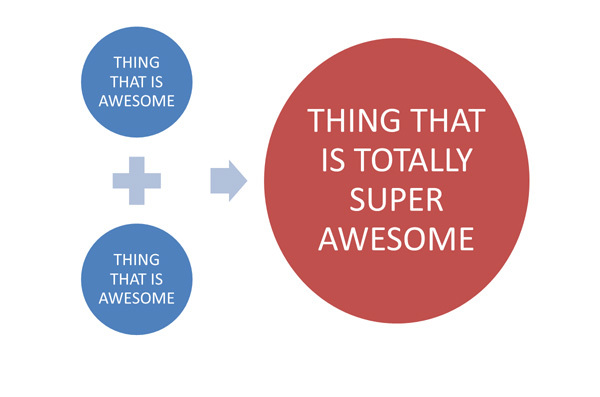 A: The Principle of the Multiplication of Awesomeness. 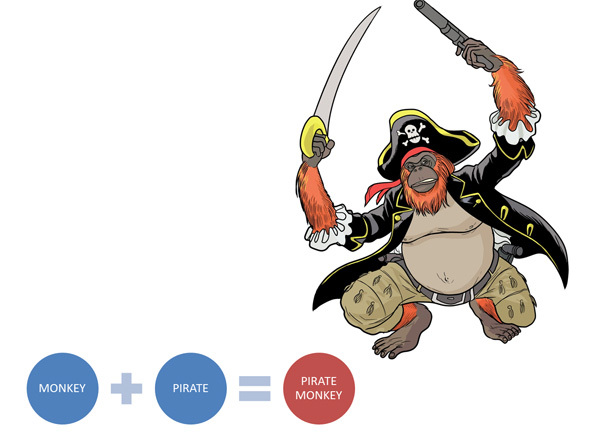 I came up with this idea as kind of a joke on the lazy 'it's x meets y' elevator-pitch nature of so many comics / cartoons / films these days ("It's Cowboys... VERSUS ALIENS! 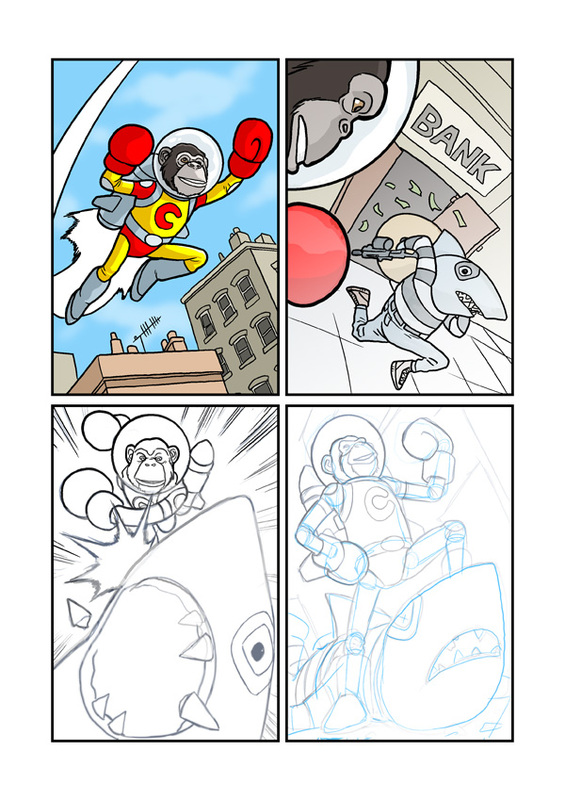 "), but actually as a way to come up with some Fun Stupid ideas to get kids started making their own comics, it works pretty well. And, I think, is in fact a fairly accurate representation of how creativity begins, albeit in a kind of reductio ab absurdum form. Because really, that's what any artist or writer is doing when they come up with a new idea - taking elements of thoughts / concepts / sensory input from their experience and combining them in (hopefully) new and (maybe even) interesting ways. 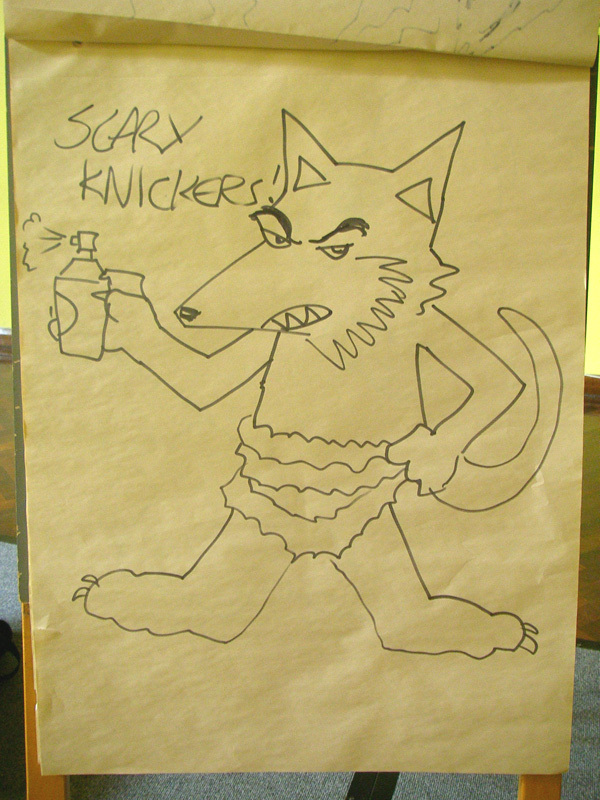 Anyway, when doing a talk I usually manage to rein in the pseudo-philosophical waffle and concentrate on the Drawing Fun Awesome Silly Things part, and the events in Leicester and Hove were a lot of fun on that front. It's always fun trying to come up with a story live in front of a roomful of excited kids, coming up with characters and plot points left right and centre based on their ideas. It's a very blurry photo, I grant you. 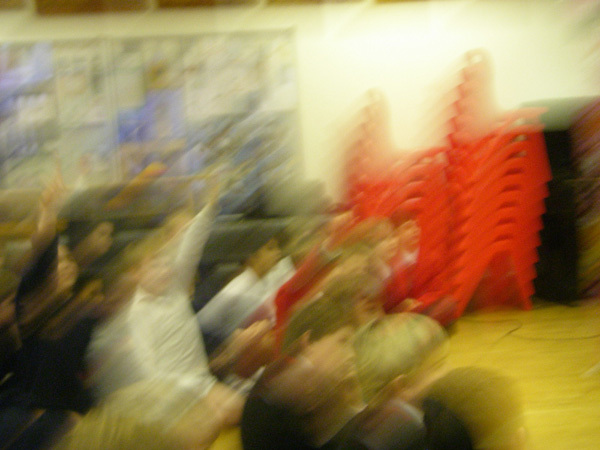 but I think it kind of captures the atmosphere of doing one of these sessions. Between the strips I'd draw live in front of the audience and then the strips the kids would create themselves in the workshop sessions, many exciting and doubtless soon-to-be-incredibly famous characters were birthed into the world on this trip, including Mr Sucky the Millionaire Octopus, SkunkBomb the Super-Skunk, Bob the Funky Riot Penguin and my personal favourite, D.O.R.I.S (that's Devious Offensive Racist Intolerant Squirrel... I *think* that was right, anyway.) And of course... SCARY KNICKERS. Any attempt at explanation would be inadequate, I fear. I'll be doing a bunch more events over the next couple of months, and I'm very much looking forward to them - will post the details and dates here as and when. There's loads more details about talks and workshops up on the events page on my website, so if you are a teacher or librarian who would like to get some comics-type fun going on - why not go check that out? Huge thanks to Ian Burley at Leicester libraries, to Lauren Bennett at Random House and to Vanessa and Julie at the Book Nook for organising these events and for looking after me so magnificently on my travels! And most of all to the children of Leicester and Hove for being so enthusiastic, entertaining and just occasionally, completely insane. 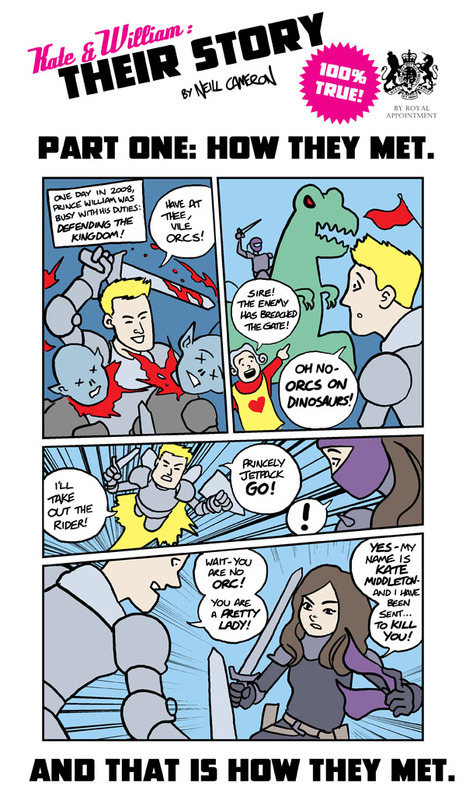 I've seen like two stories in the past week about comics companies that are jumping on the royal wedding bandwagon by producing tie-in comics/ Kate & William biographies, so I thought I would get ahead of the game by doing my own! And making it totally the best one. Unfortunately I don't really follow all the news or indeed care even the tiniest little bit about the royal family, so I've had to fill in a few gaps in my own knowledge with carefully-pieced together conjecture. But you probably won't even notice. Many, many people have been in touch over the last couple of years to ask about the possibility of buying poster-sized prints of individual letters from the A-Z of Awesomeness. And, because I am extremely quick to respond to such things, I have just made some. 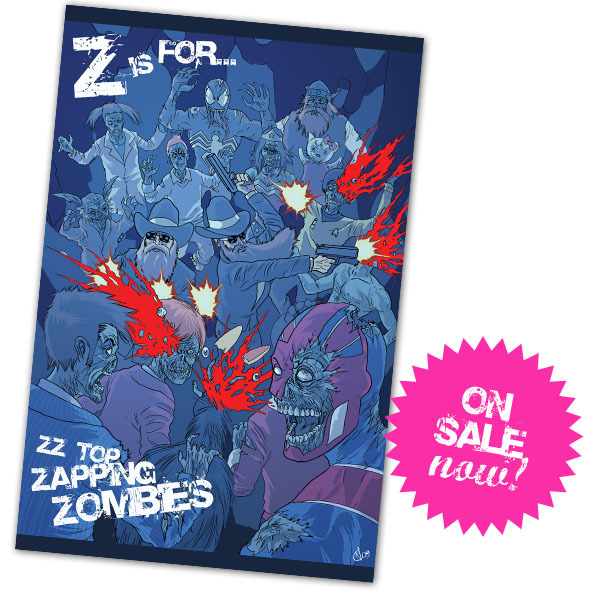 Posters of the Z is for... image are now avaiable from my new shop page! See, I get there. It takes a while sometimes, but I get there. Hey, remember when I made those cardboard mo-bots? 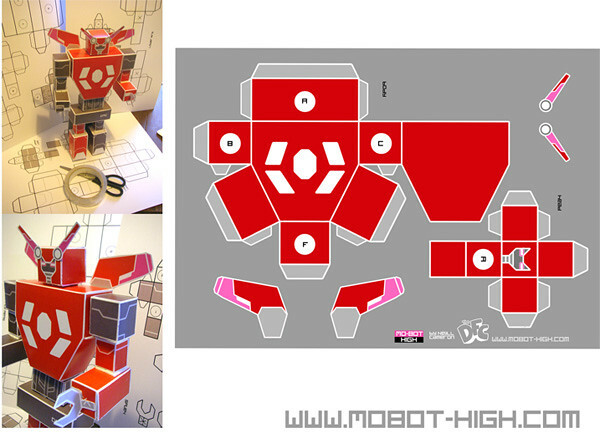 Well I've put the kits to make 'em up on the Mo-Bot High website, so that you can download and make your own! There are two versions, one pre-coloured in Asha's colour scheme, and one blank for you to colour in and customise as you like! 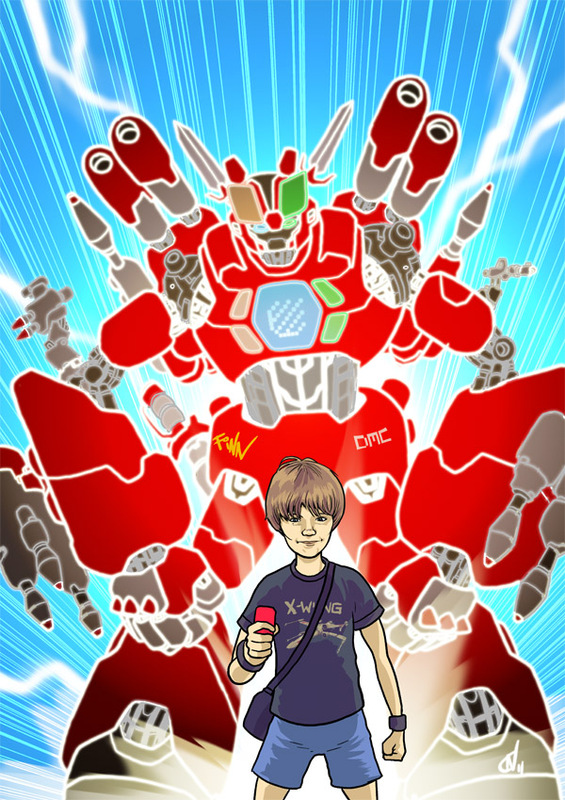 If you make a mo-bot, take some photos and send 'em to gallery@mobot-high.com and we will stick them on the website! Happy New Year, everyone! Last year I set up a shop page on my website, and was delighted to discover that people did actually use it to buy things from me. Encouraged by this early success, I've now set up a newer and frankly better shop using BigCartel, to allow for ease of adding products, managing postage rates etc, as well as to stop me losing my mind messing around with 1000 pages of hand-coded HTML. Please go and buy things! Also: EXCITING NEW THINGS to to go and buy, coming soon.